Converted for the ZX Spectrum and Atari ST by David Quinn. Converted for the Commodore 64 by Brian O'Shaughnessy with loading screen by Paul Docherty and music by David Whittaker. Also converted for the MSX computers in 1987 by Probe Software, but details are unknown. Converted for the IBM-PC compatibles by Brian O'Shaughnessy, and published by Keypunch Software, Inc. in 1988. We have another request about to be filled here. 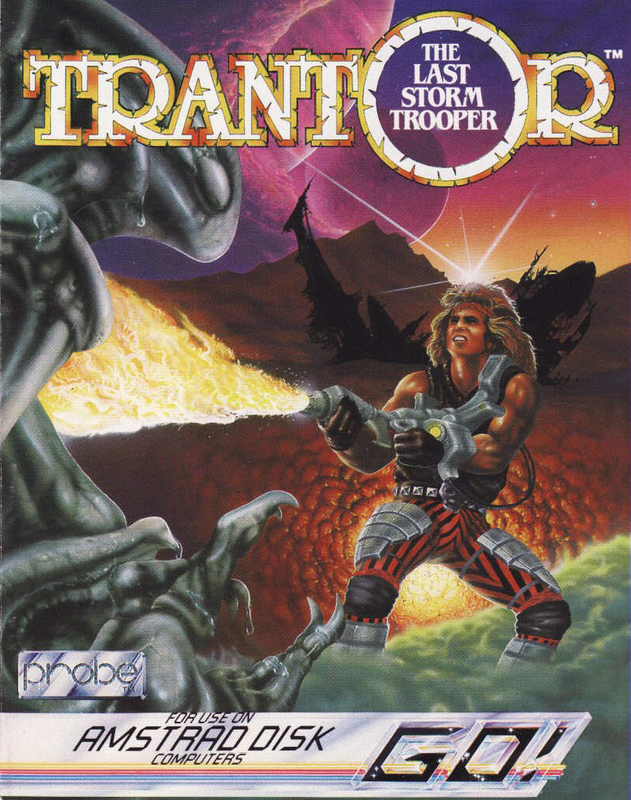 This one I have very low expectations of, due to it being rather boring and awkward on the C64, which is the only platform I've played it on so far, but looking at all the other source websites that I use, Trantor has a fairly good reputation elsewhere. It's another one of those games that got a 10 out of 10 at CPC Game Reviews, and the CPC Softs site assumedly has a rating of 16.29 out of 20.00. 7 voters at Generation-MSX have rated their version a rather good 3.5 out of 5.0; at World of Spectrum, the game has a very respectable 7.78 from 29 votes; and 37 Lemon64'ers have given the C64 version a measly 5.2 out of 10. The only DOS rating I could find was at MobyGames, which was a surprisingly low 1.5 out 5.0, considering Home of the Underdogs' review thought it a good effort (but they didn't have a rating). In any case, this looks to be another interesting comparison. Basically, Trantor: The Last Stormtrooper is a shooter/platformer with a race-against-time element. Your mission is to find eight code-letters, decipher the code and enter it into the main computer. The correct code gives you another three letter code for a teleporter, wherein you must enter the said three letter code, which will "teleport" you down to the planet Nexus. (Thanks to C64endings.) While you are at it, you need to flame down a whole lot of enemies, and make sure your strength meter does not get completely depleted. Aside from the code-letters (which, when picked up, reset the timer), other pickable items are hamburgers (for strength), clocks (for additional time resets) and fuel for the flamethrower at fuel-points. The game area consists of six levels, which you can freely move on by using lifts. From what I have experienced on the C64, the game feels repetitive and boring for repeated plays, so if you have no idea what you're doing, the experience can be very strenuous indeed. For the time of release, the big player sprite must have been an awesome thing to behold, but since my focus is usually on gameplay, I never got much out of it. Therefore, I shall do a more proper review later on, so let's see if trying the game on all the other platforms has any effect on my opinion. MSX (top right) and ZX Spectrum (bottom right). After having played the game with little success more than enough times on each computer, I stand by my earlier opinion - the gameplay is horrible. For those of you unfamiliar with the game, the controls are as such: you run left and right through narrow corridors - meaning, you have no room to jump around or dodge anything. You can duck by pressing down, although it helps very little, because your stormtrooper's sprite takes so much space on the screen; you jump with up, although you can only jump forwards in an awkward and uncontrollable manner. Up and down can also be utilised in lifts, although you need to be almost precisely in the middle of the lifts to be able to use them. Even then, you can't always tell whether you can go down due to the lack of space on the screen. Ducking can also be utilised for searching containers and using computers. Finally, the fire button is for shooting your flamethrower, but shooting the flame feels awkward in that you can only shoot one short flame at a time, and in most versions, you can only control the flame by your own movements, since it follows your line of fire EXACTLY as you move. In most games with a flamethrower, it throws a continuous flame, which you can aim just as you please. In Trantor, the flame can only go through 1/3 of the screen height at best, never getting high or low enough for you to get to half of the enemies, who like to float around in the ceiling or roam on the floor. The SPECTRUM version differs in a very significant way, in that you can only shoot in one line - even jumping around and ducking will not move the flame away from the center line of the action screen. It also happens to be the only version with scrolling problems when the screen gets busier with more enemies. Hardware-related optimization issues, I would imagine. Funnily enough, even though the MSX version is missing quite a lot of the game's initial bits, the game plays surprisingly close to the original - indeed, there is nothing whatsoever different here. Even the scrolling is similar to the original. Apart from the lack of choice for control method, the differences are entirely graphical. The DOS version doesn't have the automatic forward jump feature, but whether or not that's a good thing, is up to each player to determine. It is a unique feature not available in other versions of the game, but I'm not sure it's all that useful in this game anyway. Somehow, having a straight-up jump here makes the game feel more clunky and awkward than it already is, but I have to say the DOS version feels a bit more uncomfortable compared to the others anyhow - it just feels bothersome to even move around. As far as I'm concerned, I think ATARI ST has the easiest version, having no vertically moving poles to drain your energy. It also has slightly more room for movement than any other version (slightly smaller sprites), as well as more stamina for the player character - at least it feels like the energy gets drained less easily than in the other versions. Although the ST version has more small aliens flying around, you do have a better chance at killing them due to having more room, and the flame seems to stay a bit longer on the screen. Finally, the COMMODORE 64 version shares the straight-up jump mechanic with the DOS version, but here, it doesn't really bother as much, because the scrolling is very smooth and the controllability is quite a bit less awkward. But because the shooting distance is a bit shorter than in the other versions, I'm going to have to give it a lower spot than I intended at first. This is the reason why this game is so well regarded in some circles. Not only you get a huge player sprite along with lots of nice animations, but you also get an early example of a proper intro animation sequence, which needs to be loaded separately into the memory of each machine it was featured on. This unfortunately excludes the DOS conversion. This sequence separates the in-game "dream sequence" from the plot so far, but it hasn't been explained anywhere, whether Trantor's spacecraft disappears as he falls into his own psyche, or does the force of the explosion (as it happens on the ST) make Trantor bump his head and make him unconscious so that the "dream sequence" begins with that. I'm more with the latter explanation, if it has to be explained somehow. Screenshots from the intro sequences. Top row: Amstrad CPC. 2nd row: ZX Spectrum. 3rd row: Commodore 64. Bottom row: Atari ST. Shown above is a three-screen series of all the versions of the intro animation sequence, showing all the necessary elements of it. Clearly, the ATARI ST version shines here, but then it is the most capable one of the lot. Having said that, all the versions of the intro sequence are rather impressive on their own accounts, and almost worth owning an original of the game for. Curiously, although the SPECTRUM intro has much less colour than any other version, it has more detail in the animation than the other two 8-bits. Still, from the 8-bits, the AMSTRAD version looks the most fitting for the game - which should be much of a surprise, since it's the original. In contrast to all the others, the MSX version shines with a complete lack of an intro sequence... and even a main menu. Once we get to the title screen, we get slightly different amounts of animation, as well as different stylistic choices. The SPECTRUM offers an imploding Probe logo, which makes a few flips before settling to its final position in the main menu screen, but I didn't include it in the collage above due to it having little sense as such. Had I the skills to create some proper gif animations, then of course that would have been a different case altogether, but for now, you'll have to settle for that single shot. For the AMSTRAD, C64 and PC versions, the team included a similar PROBE letter-jumping sequence, which is fun to watch for the first few times when you play it, but get old rather soon. In the versions that have a possibility to redefine keys, a menu has been included - otherwise you will only get a list of controls. For this bit, I prefer both the SPECTRUM and ATARI ST versions over the others. Screenshots from the entrance floor. Top row, left to right: Amstrad CPC, Commodore 64, DOS. Bottom row, left to right: ZX Spectrum, Atari ST, MSX. The rest of the game will be dealt with in smaller sections, starting with the entrance floor. We can already see that the least impressive version is the COMMODORE 64 version, combining the monochrome main sprite from Spectrum, the lack of colour from DOS and all the other aspects from Amstrad. It truly is a sorry bundle of elements, but at least it scrolls slightly better than the other 8-bits. Sure, the AMSTRAD original has big and colourful graphics, which can even be considered very impressive, but the scrolling, while quick enough, is a bit choppy. The DOS version looks good enough, and runs nicely, but the CGA colours make it horribly outdated, even by 1988 standards, considering VGA was already there. The SPECTRUM version looks detailed and pretty, but unsurprisingly has single-colour sprites, and while you can't see it here yet, it suffers from vast amounts of colour clash - proof of it later on. In the MSX version, you get the same scrolling effect as is on the Amstrad, but then the time display and action screen have switched sides, and the colouring is completely unique and the details are combined from Spectrum and Amstrad, which gives a rather interesting overall look. As for the ATARI ST... well, we have more colour than in the original, higher resolution, more detail, better scrolling... can't really ask for anything. Screenshots of a computer terminal. Top row, left to right: Amstrad CPC, Commodore 64, DOS. Here we have examples of the computer transmission screens. The top row's examples are as similar as you could ever wish them to be, but again, the ATARI version has more text on the screen, which adds to the overall feel slightly. It's not necessary, but it's a nice addition. The SPECTRUM version takes a slightly different look, going with a blue screen (gasp!) with white text, and the found code-letter is displayed in your time display instead of the computer screen. A nice alternative, but hardly worth writing a novel about. As expected, the MSX version has no proper computer screen, and instead you get a black overlay on top of the action screen with some basic white text on it. Trantor's shield, left to right: Amstrad CPC, ZX Spectrum, DOS, Atari ST, Commodore 64, MSX. Let's take a quick look at one of the more important utilities you will find in the game - the shield. It's basically a forcefield that will kill any alien lifeform that touches it, mostly rectangular, but on the ST, it's an electric dome-like thing. As usual, you can't see it here, but all the rectangular shields are animated similarly to what white noise on the TV looks like when there's no transmission. And as usual, the MSX version lacks a proper shield, and instead Trantor only changes colour from blue to white. I kind of like the original AMSTRAD version the most, but the SPECTRUM shield looks the clearest. Screenshots from the Big Alien's corridor. Top row, left to right: Amstrad CPC, Commodore 64, DOS. your flamethrower, so the jump-scare will most likely only ever be for that one time. Anyway, the jump-scare will not be as effective, if the area doesn't look like there could be something like that coming for you, so the ATARI ST and MSX versions are a bit of a letdown in this case. Then, the SPECTRUM version suffers from huge amounts of colour clash, but at least the monster is suitably ugly - and this is where the MSX version gets something right. Somehow, you can only see the other half of the monster walking in the C64 version, so when the jump-scare finally appears on the screen, it only looks silly. The AMSTRAD and DOS versions are the only ones that sort of manage to deliver the goods properly in this bit. There are more floors in the game to walk through, but the game requires a bit of luck as well as skills, so I didn't have the patience to get to the finish in any of the versions. Only on the C64 I could get as much as 92% of the game completed with a few tries, but even then I didn't feel like too many of the floors required much attention in terms of screenshots. Besides, if you actually enjoy playing this game, you know there are only a very few other mentionable things awaiting for you, and I don't want to spoil everything here for those of you who haven't played it that much yet. For that sort of spoilery, you might as well go to the C64endings website. Death scenes. Top row, left to right: Amstrad CPC, Commodore 64, DOS. Bottom row, left to right: ZX Spectrum, Atari ST normal, Atari ST with Big Alien. Finally, here are the death scenes from all the versions. I was happily surprised by the bonus death scene featuring the big alien on the ATARI ST, and unhappily surprised by the lack of a pre-death explosion defeat-posture on the AMSTRAD. Also, true to its lack of other features, the MSX version has no proper death scene at all, so I decided not to include it here. So, the winner of this section will not surprise anyone but the most faithful supporters of any less capable hardware. But I will say this: the Amstrad owners can be proud of having their version above all the other 8-bits. The Spectrum version would have to finish last due to the bad scrolling and horrible case of attribute clash in certain places, were the MSX version not completely lacking so many of the key elements of the game. And sure, the C64 version looks the most boring of the lot, but it has more colour than the DOS version in the end, and it scrolls very smoothly, so it'll take the middle spot here. This is a difficult one, because the top three are surprisingly close to each other in quality. Only in the original AMSTRAD version, we can hear a speech sample "Trantor, last stormtrooper" for the loading screen, but to be fair, it's not much of an advantage against the other versions, because speech synthesis at that point was nothing new on any of the computers. It is a nice exclusive addition, but has little meaning in the long run. Starting from the bottom, the DOS version only has either music or sound effects, both of which are played from the PC speaker, and are primitive and beepy in execution. Neither of the options are even close to being comfortable, but having the music on constantly is the lesser of two evils. That said, the theme tune is almost unrecognizable from the original. Even the lack of music on the MSX is preferable to the constant beeping of the DOS version, and happily the MSX version has some basic, but nice sound effects so that it doesn't need to take the last place in vain. Although the SPECTRUM version was not made to support the 128k mode, the beeper sounds are surprisingly well made, and are much more enjoyable than the PC speaker bleeps. Although you get no intro tune, the title tune played in the main menu is rather nice - it's slightly slower than the original and is in the key of C minor, instead of A minor. The slowness of the tune somehow fits the game's overall mood better, I think. As for the in-game sound effects, they are only slightly upgraded from the predictable Speccy pips and farts and all that sort, but in the end, they work quite well in the game, as it's not needlessy noisy all the time. Unfortunately, this can't be said of the COMMODORE 64 version, which has a constant noise of some sort in the game, and it gets really uncomfortable. The most annoying sound is Trantor's heavy running noise with a reverb effect that lasts until next week - and it is there constantly, unless you choose to listen to the music instead. The music is very nice, though - it's from the original key, but closer to the Spectrum version's tempo, which is nice. And for my ears, the theme tune sounds the best here, although not by much. The intro tune, in the form that it is represented here, is easily the best of the lot. But, I would have liked to have a good option for the good music as well. I'm not sure if I value the AMSTRAD's soundtrack above or below the C64 one, because there are some things that make it feel just as much better as some others make it worse. The intro tune has a slightly random and messy feel to it, because whenever there's something new and unexpected happening in the animation, the music abruptly changes tempo. Also, some of the instruments sound a bit off-balance, but maybe that's how it's supposed to be - or maybe it's just the emulator's misrepresentation of the real thing. Since I don't have a real Amstrad computer here, I can't check the truthfulness of the emulator now. Anyway, the title theme tune, as mentioned before, is in A minor and is pretty quick in comparison to the previous two - the tempo is somewhere in the vicinity of 148 beats per minute. It's very well made, but I feel it's a bit too cheerful for the game in this form. Happily, the in-game sound effects are much better here than on any of the versions so far - the flame thrower and the destruction it causes offer some very diverse noises, and the other effects are suitably bleepy, and it never gets too heavy on the ears. It did come as a surprise that even the much more capable ATARI ST version didn't include the loading screen speech bit. It also came as a surprise that the intro bit is radically different: more upbeat and less random-sounding tune at first, then a pause for the spacecraft's explosion, then finally another new even more upbeat and adventurous tune. Not necessarily what the game's designer was thinking of, but it does give a better dramatic introduction to the game. When you get to the main menu, the familiar theme tune kicks in, and stays there until you turn the computer off. It sounds little different from the original, in that both utilise an equal amount of channels in a similar way, although perhaps the percussion track has a slightly different beat going on. The most advanced aspect of the ST soundtrack is that you can hear both sound effects and the music simultaneously during gameplay, and the effects are happily as unintrusive as in the Spectrum version, and are restricted to only the necessary sounds. Now, I believe the leading duo are pretty clear here, as well as the bottom two. The contest between our most troublesome duo has been made difficult due to a lacking representation in both cases - Spectrum is completely missing an intro tune, and C64 has bad sound effects. But due to the importance of the intro bit in this game, I have to give C64 the higher spot. I'm still not convinced this game has much of redeeming qualities, when strictly considered as a game. As a piece of demonstration of programming skills, sure, it shows that some graphical things could be done relatively easily, but with the cost of having an uncomfortable playability. The Atari ST version only went to show that the graphics are usually secondary to gameplay. It might not be the most impressive one of the lot, but it is the only version of the game I'd be willing to play in the future. Perhaps the results are not quite as good as some of you hope them to be. Frankly, I just don't find the game all that impressive, even by 1988's standards. But hopefully, the person who made the request has been given some sort of peace of mind. It's not often that the Amstrad actually wins its 8-bit competitors, so it's a clear win in that sense. That the 16-bit Atari won the whole thing should come as no surprise, really, but I'm not entirely sure you can really "win" as such with this game. Finally, as a point of interest for all you collectors out there, the game was originally shipped with an audio cassette of a song called "The Fight" by an unknown band called Resister. The tape is pretty hard to find these days, so if you're curious to hear, what sort of a rock song could be connected to this sorry piece of a game, you can download it from CPC Softs. Thanks for reading, hope you enjoyed it more than I did. Next time, it's time for another twofer - the first one in four months almost! Comments, corrections and suggestions are welcome as always. First Bumpy, now Trantor. You definitely delivered the Amstrad friendly comparisions you promised. Thanks for that. As for the comparison itself, I totally agree with everything you wrote here. Trantor isn’t a good game at all. It is boring, repetitive and much to short. Out of all available versions, the ST and CPC Versions are the only playable ones. And yes, the Atari version is, as expected, a bit better than the Amstrad one. So your comparison is spot-on, no doubt about that. From my point of view the most important question regarding Trantor is: why do we remember such a bad game? Well I guess it’s remembered for only one reason and that is the great graphics of the CPC version. Back in the day it was one of the games that really showed what could be done on the machine. Please keep in mind that the Amstrad suffered from many bad Speccy ports. The Programmers often had very little time to do those ports. There is a very well documented case of a „bad“ Speccy port on the CPC Wiki (http://www.cpcwiki.eu/index.php/R-Type). The poor guy was given only 21 days to do the job. Compared to those standard speccy ports Trantor was something special. David (Earthworm Jim) Perry, today a pretty well known programmer, and Nick Brute demonstrated that the Amstrad could do graphics that are comparable to the ones of many good looking C64 games. 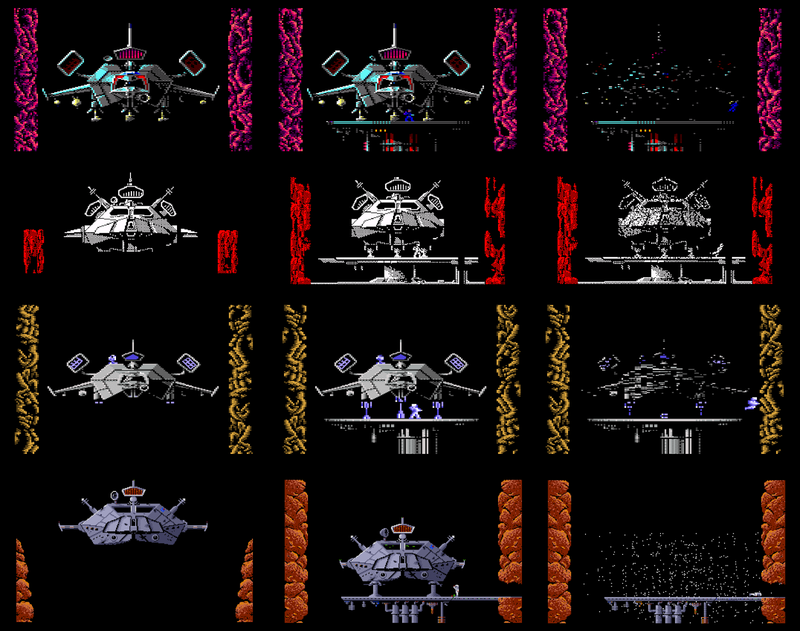 Unfortunately there are only a few dozen CPC games that are on the same (graphical) level as Trantor. Perry/Brute later created another well known CPC Game called Savage (they developed the very good Speccy Version of this game too). I really would like to see you do a comparison for this one. It has even better graphics and it’s a much better game. Another game I would like to recommend for future comparisons is Exelon. A briliant game on both, Speccy and CPC. Thanks for the comment - I do aim to please, or at least be as truthful and balanced as I possibly can, you know. =) Too bad the results often depend on the game itself, not necessarily on the hardware. What you said about the "bad" Speccy ports on the Amstrad begs the question: why did they port games from Spectrum anyway, if the hardware was capable of something different? Also, I've been wondering about where are all the Amstrad-exclusive games? In most cases, if there isn't an 8-bit counterpart for an Amstrad game, there is at least an Atari ST port, which is more often than not superior. I'd love to add some more Amstrad titles to my Unique Games series, but there just don't seem to be any. All these games should be real exclusives (as far as I know). I'm not sure if both really stayed exclusive. World of Spectrum has an entry for Pharaon, but they say it's not available (Missing In Action!). Please take this list with a grain of salt. I'm not 100% sure about it. I agree about the comparison for R-Type. That would indeed be pretty pointless. I only mentioned it as an example for a well-documented “bad” Speccy Port. I think games like Trantor, Savage (by the way, only the first level is similar to Trantor) and Exelon clearly proof that the hardware was/is capable of something different. To answer your question you have to take a look at the European (homecomputer related) gaming market of the 80s. The Speccy was a huge success in the UK and the C64 was successful almost everywhere. The Amstrad CPC on the other side was only doing well in Spain and France. Because of this the market for CPC games was much smaller than the market for the other two systems (especially from the point of view of UK based developers/publishers). And of course, only developers from Spain and France had a reason to choose the Amstrad as the lead platform for development. But because of the small user base, exclusives made no sense at all. The Atari ST for example was also very popular in France. So French “Amstrad 8-bit exclusives” where often released on the Atari ST too. But there are some really great Amstrad games from these countries. Unfortunately some of them never received and international release. Take “La Abadía del Crimen” (http://en.wikipedia.org/wiki/La_Abad%C3%ADa_del_Crimen) as an example. Many people (including the guys from Retro Gamer) consider this game to one of the best 8-bit games of all time. It was never officially released outside of Spain. The CPC6128 was the lead platform for development. While the ports for other systems are quite good, the CPC original remains the best version. Speccy and C64 are your logical lead platforms for development (because of the big install base). You realize that you can make some extra money with ports for other, not so popular computers. But they have to be cheap, since you don’t expect great sales numbers out of this. You know that the Amstrad has the same CPU (Z80) as the Speccy. Plus the CPC can run a simple port of a Speccy game with very little changes. No optimizing needed. You can hand this over to a single programmer and give him a few days to do the job. What would you do? As I said before, this is well-documented for many games. It happened all the time. And it’s the main reason for the existence of many bad multiplatform ports on the CPC. To be honest, we cannot even blame the developers/publishers for this. They had to make money. It was simply a business decision that had nothing to do with the capabilities of the different computers. Graphics: 2. What is the maximum scale? 6? or 10? Even so, 2 is totally unfair, since Trantor for the ZX Spectrum has WONDERFUL graphics and ANIMATIONS! In summary, I'd give it an 8 out of 10! Playability: 2 - Well, not the best I've seen, I agree, but I'd give it a 5 out of 10! Sound: 3 - Yeah, fair. 3 out of 10! TOTAL SCORE: 7 (I guess the max is 20) - Well, not my opinion: I'd give it a 7 out of 10! Maximum scale is always strictly dependant on the number of versions made. So, if a game has, say, 9 versions, the maximum score for any version would be 9 points for any section, unless I decide that some versions are equal enough to give them a similar score. So it's 6 points maximum per section here. But hey, you're certainly entitled to your opinion, I'm only giving my views as I see them and give the scores in a mostly unfair mathematical basis. If you're not happy about the overall results, I'd suggest you read the whole thing through properly and make a more thorough commentary. Preferably even do the comparison yourself from start to finish. ;-) Anyway, thanks for the comment. Yes, I agree that the ZX Spectrum version was underrated. Graphics are pretty decent, as someone has said before, as well as animations. 8 out of 10, I agree, or 4.5 out of 5. ZX spectrum has colour-clash issues, yes, but that is a limitation of the machine. That is not a VITAL factor to reduce score on graphics that radically, in my opinion. Besides, as a last word, I don't think that the comparison of 16-bit systems would make any sense along with 8-bit systems. There is no way an 8-bit game could surpass its 16-bit version for logical reasons. So, the lists are not fair and the 8-bit systems should be separated from the 16-bit. Opinions are a difficult thing, because they're vastly dependant on personal preferences, which on the other hand are molded by the learned models of what should be preferred because it's the norm. I, for one, cannot give an absolute truth of what 8-bit graphics in games are better compared to other 8-bit graphics, since I have no interest in machine architecture, so limitations are limitations, and I cannot NOT consider them when doing comparisons, particularly when a problem like attribute clash renders the graphics less appealing than some other version with no attribute clash. The sense of including 16-bit versions is to point out that graphics and sounds don't necessarily make for a better gaming experience. If you can't read the comparison content beyond the admittedly unfairly given scores at the end, then don't read the scores. I'm not going to alter the style of the blog anymore, since I'm quitting this thing in March.